As you know, your countertop faces an ongoing assault of hot pots and pans, spills, cuts, scratches, and scrapes. It takes a beating on a daily basis and everyone still expects it to look great. And the truth is, some materials hold up to the daily attack better than others. 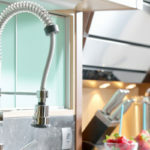 Because countertops are often costly when creating your new kitchen or remodeling your existing kitchen, here are some counter options along with an examination of their function and quality. High Density Laminates also known simply as Laminates are manufactured from plastic, paper, and lots of pressure. The first high density laminate may still be the most famous – Formica® – but today there are many more manufactures producing this material which delivers both an excellent price and outstanding value. 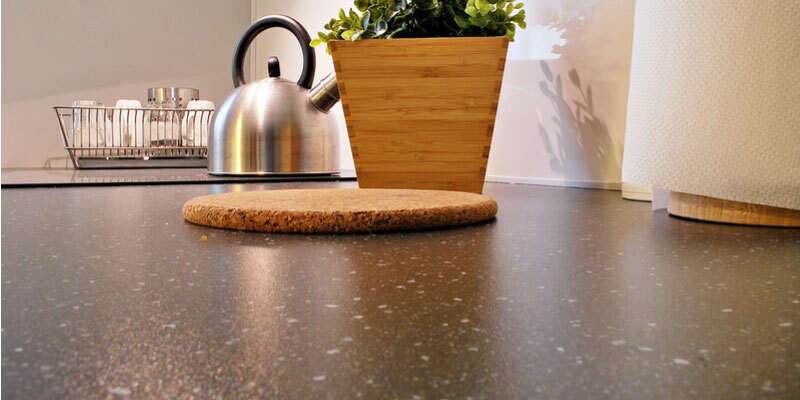 While laminate may have fallen out of favor recently for the pricier countertops of granite, quartz, stainless steel, and concrete, premium quality laminate is still a great choice for your kitchen counter – especially if you have a limited budget. Laminate costs much less than the more expensive competitors and can present exceptional value as well. When laminate was introduced, it was a modern marvel – long lasting with little maintenance required – and it still is today. Made from multiple layers of plastic and paper under high pressure, laminate countertops can mimic the durability of natural stone. Today’s laminates offer textured finishes, realistic stone design, and even translucent layers which look strikingly similar to natural stones like granite. 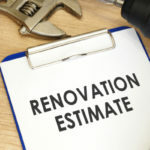 This means those of you remodeling your kitchen can get the look of granite, travertine, steel, copper, slate, and so on at a fraction of the cost – making laminate an exceptional value. As we explore value packed alternatives to those costlier, currently trending alternatives, ceramic tile is a wonderful option for those on a budget. While ceramic tile varies greatly in cost (on sale ceramic tiles versus hand painted artsy ceramic tiles), tile is quite versatile – even more so than laminate or stone. Ceramic tile is durable and long lasting, though it can stain and crack, but less than more expensive options like granite, concrete, etc. When choosing tile, it is important to select tile approved for countertop applications (which is most ceramic tile). Ceramic tile is also green, made from clay and sand, which means no dangerous chemicals to damage the environment. On top of that, a quality ceramic tile countertop will last a long time – nearly as long as stone countertops with a much lower price. If you are still craving stone for your kitchen, but your budget won’t allow it, consider stone-look tiles which will save you a large among toward your budget. Also remember with all the colors, textures, and patterns available in ceramic tile, they allow you to express your creativity in creating your signature kitchen style. Another countertop option, known for both value and price is solid surfacing. Corian® is the most well-known, but other brands are growing in popularity. Solid surface countertops are usually the least expensive option and offer outstanding durability. 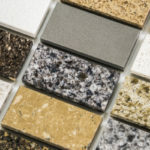 With these countertops, you have your choice of colors, but texture and appearance not so much. 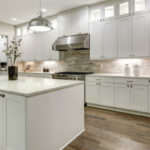 Solid surface countertops come in matte finishes – but even so – they are impervious to stain, can be repaired when damaged, and stand up to the punishment faced by countertops everywhere. These counter options are the ideal choice for those who are on a limited budget, but still want the style and durability of more expensive options. Laminates, ceramic tiles, and solid surface countertops make the grade for price, value, and longevity.